“Show me the boat again Dad?”, I would ask on a sunny summer Sunday. That sunken boat was a great source of fright. As he told the story, my Grandfather was rowing rocks across the lake, and the old boat sank. I love lakes. Lake water is dark, scary, unfathomable. From the safety of a rowboat I gaze deep into its darkness. Sometimes an errant fluff on the surface or a partly submerged weed will appear. Sometimes a wildly reaching root from a submerged waterlogged stump or a branch from a long-fallen log will suddenly spook up from the translucent depths. Lilies and weeds grow in shallower areas. The weeds, reaching toward the water’s surface, wave at you from the dark. I used to pick white and pink water lilies and bring them home so Mom could display them in a shallow bowl on the verandah table. 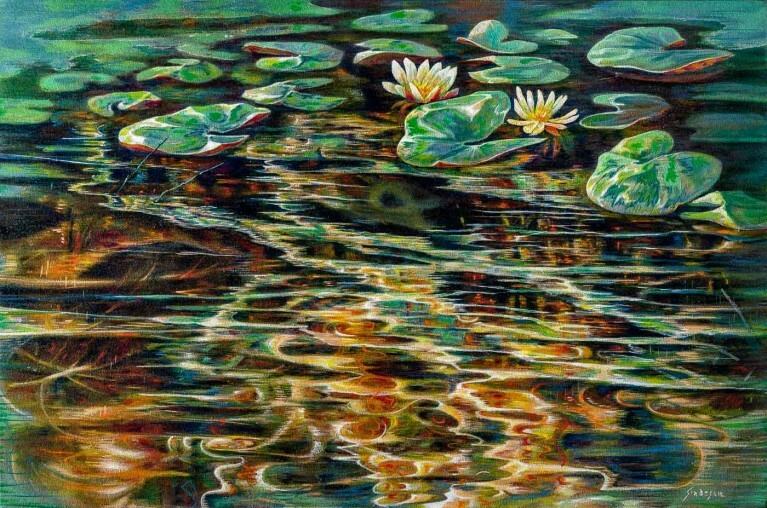 In “Water Lilies” I have tried to show those monuments from under the lake, from under the Lilies. Love the colour palette you give the depth and the surface shimmer. You captured the peaceful moments of peering into a pond/lake . Awesome grandparent connections to the art work. thank you for leaving a comment – your thoughts are thoughtful and always welcome.